(1) Prices appealed from last fall's crosswalk final prices. Such crosswalk pricing appeals were made around December 2016, roll into the next summer (July 2016), with final decision in mid November, as shown here. (2) Prices are published for brand new 1/1/2017 CPT codes, if crosswalked. If the code is to be gapfilled rather than crosswalked in CY2017, that was announced now, rather than a price. (3) Changes, if any, to MAC Gapfill Prices that were announced around October 1. This would be due to internal administrative appeals that do not have a public record. 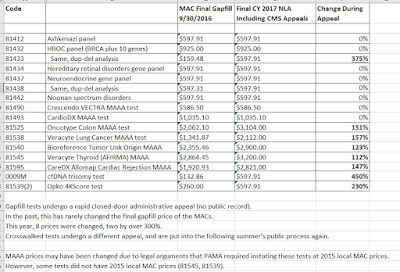 Raised prices for a number of sole source MAAA tests were just published. 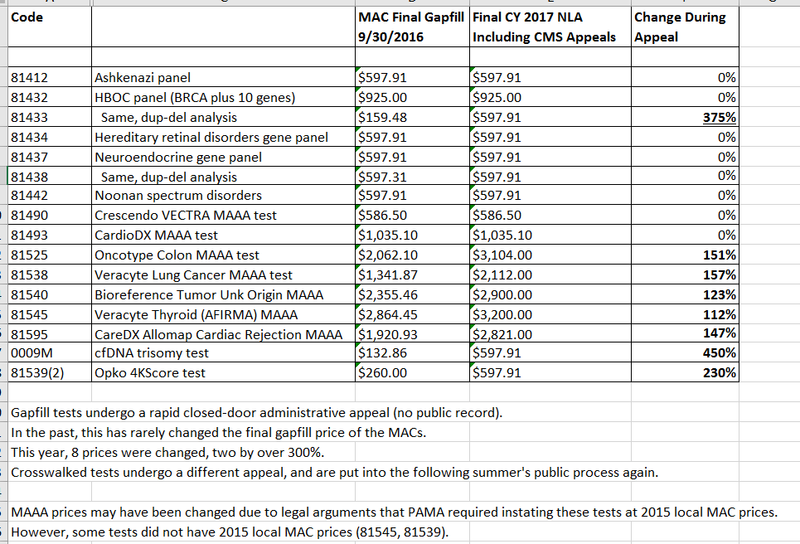 Regarding last-minute MAAA pricing upgrades, coverage at Genomeweb, here (subscription). For my PDF memo on what happened in this year's crosswalk/gapfill process, in the cloud here.